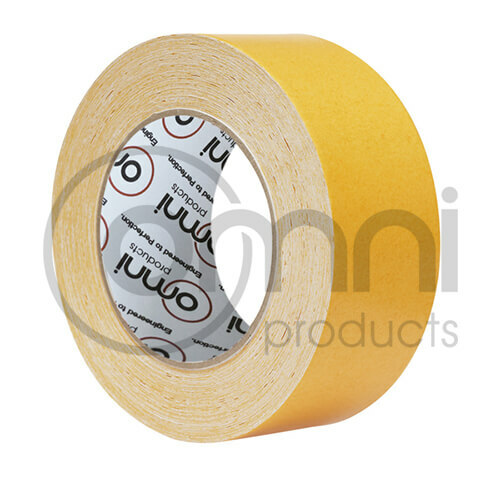 The Omni Double Sided Cloth Tape is an adhesive tape that comes with cloth backing which makes it rugged, flexible and highly durable. The cotton cloth used for making these tapes come with aggressive adhesives which make it perfect for installing carpets and other items on irregular surfaces. These are pressure-sensitive tapes that have been designed for usage on various surfaces. These tapes are easy to use and do not leave any residue behind when they are peeled off. The Omni Double Sided Cloth Tape is popularly used in the medical industry for securing ventilation tubes, intravenous lines and tag scrubs. Besides this, it is also used by plumbers and electricians to attach or seal different components. The tapes are resistant to tearing while also being hand-tearable, making it convenient to use in any work environment. Once the surface has been wiped clean, you can easily attach the tape and paste any item you choose on it with just a little bit of pressure to complete the job with minimal fuss. These tapes are highly economical, create minimum wastage and do not require any drying time. We offer custom slit sizing options to enable you to use them as per your requirements.